This was a weird episode. The Rapunzel storyline was filler for the most part and the pacing was strange. I did love how Charming’s two plots were woven together for the climax but it was harder to follow the timeline for everyone else. 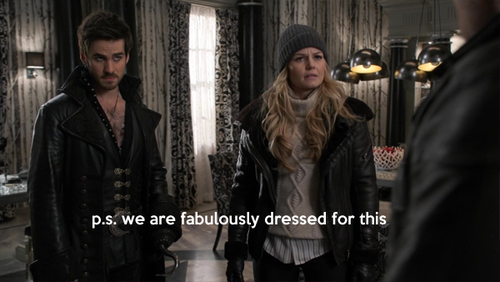 How long did Hook and Emma wander around the Storybrooke wilderness? and where did they leave the car? because they run off to help David but also get Regina on the way? and they started in the woods which should be the same woods that David is in? but Regina was at the park which is I don’t even know where?…and Snow spends the entire day with the witch I guess? he’s Charming and his default mood is confused. 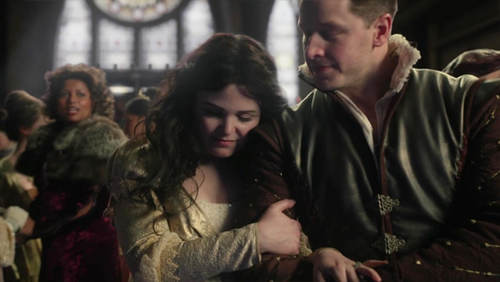 It is a very cute scene; Daddy Charming is my favorite Charming. Sadly, the cute is short lived, the lighting turns dark and Emma starts spitting some truth bombs. Emma: I never lived here. You didn’t raise me. You are a failure as a father and a knight. You can’t make it up to me. Ever. Stop trying. Do better next time. Snow: Hi confused! I’m pregnant! 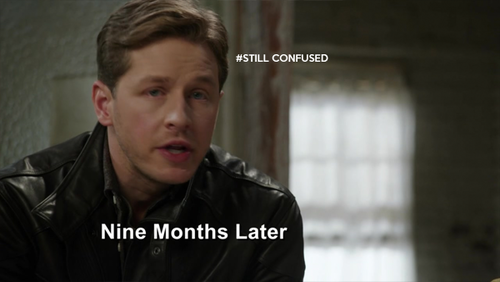 We flash forward to “nine months later” in Storybrooke. Pregnancy doesn’t work that way but since there are fireballs and dragons and Peter Pan is Henry’s great grandfather and the timeline never makes sense anyway, sure, nine months later. Snow is ready to pop. Hook: We have to find the witch. Snow: I gave away all my brains to pregnancy. Charming: I don’t have brains and I’m about to lose my courage. Charming: I got lots of heart though. Hook: Can we please focus on the dangerous witch holding us all captive and turning people into monkeys? 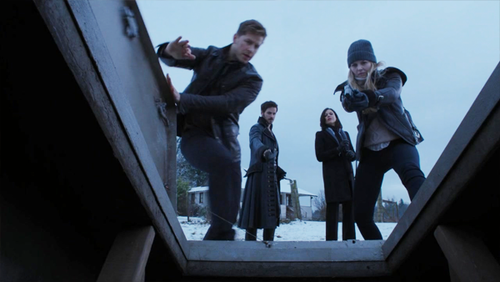 Emma: This is where I mention Neal right? Hook: This is where I remind everyone that you already fell for a monkey once, right? Regina: Someone has to protect Henry, his father might be a monkey. Emma: Let me guess who you have in mind. 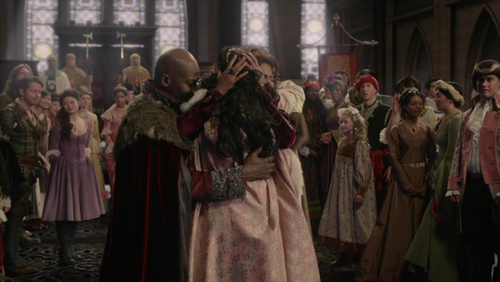 Regina: I know what is best for my son! Regina: I know what my son knows! 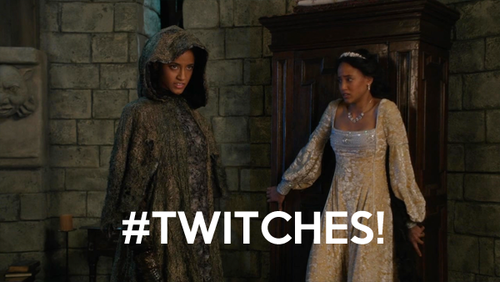 Hook: WITCH HUNT NAO PLZ? And away they go. Meanwhile in Faux Kansas, Zelena heads into her storm cellar to chat with Rumple. It is a very uncomfortable scene, particularly if you thought she could be his daughter. It’s revealed Zelena has the Dark One’s Dagger and is using it to keep Rumple in check. Zelena: But at least here you’re handsome. 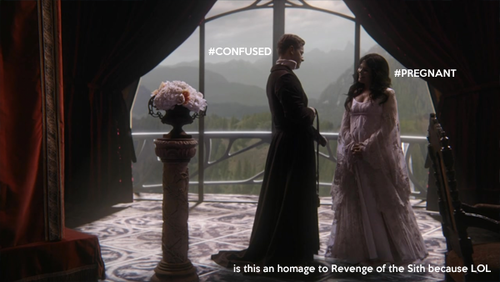 Rumple: I’m confused. Maybe spinning will help. Zelena: Spinning makes it worse. So does stubble, let me shave you with your magic dagger. Zelena: Shut up and listen to my tragic backstory about my dad making me shave him. Zelena: Oops, I cut you. Rumple: Seriously what is this scene? Zelena: Tata for now, Teacher-Daddy-Not-Daddy-Love-Interest-Captive-Scarecrow-Analogue-Rumple. Hook, Charming and Emma are CSI-ing Regina’s office to track down the witch. Charming finds something that looks like blood but uses his mad animal shelter skills to determine it is berry residue. This might be my favorite moment in the entire episode. Unfortunately for Charming, he’s called away to meet with the witch masquerading as a midwife. He doesn’t want to go, either because he’s afraid of failing as a father again or it’s just way more interesting to be on the witch hunt. But Hook and Emma convince him to go. Back in time Charming has rushed from the news that Snow is expecting to the stable where he keeps his hooch. Seriously, this episode is full of strange. He finds Robin Hood putting away his gift from the queen for helping them get the castle back. Robin: I don’t usually get paid for being a meddling do gooder, I don’t know how to handle this. Charming: Gold tipped arrows? She must like you. Robin: I’d rather talk about why you’re glugging that liquor in secret? Charming: I started having nightmares about screwing up my baby’s life before I knew I was going to have a baby. Robin: I know just the thing for that. There’s a plant that glows like a star in the dark and banishes fear when you drink it. 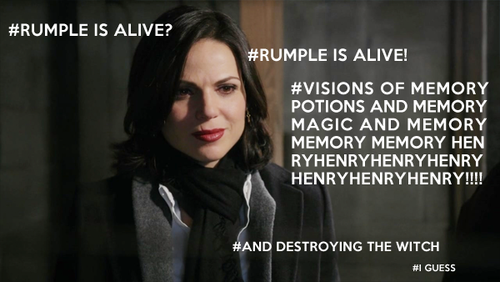 These fairy tale people sure do rely on potions a lot, it’s no wonder Rumple was always in demand! Forward in Storybrooke, Charming rushes in for his visit with Mary Margaret and Zelena. Snow pouts that he’s super agitated and obviously wants to leave but he lies that no, no, he’s just super excited about the baby. 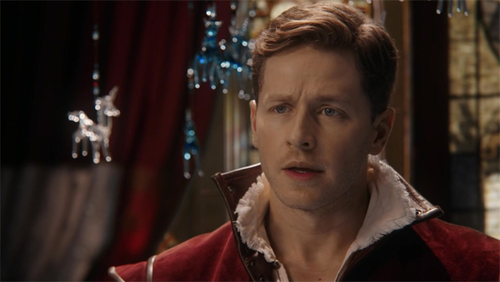 Charming might secretly be the most interesting character on the show; his inability to change is fascinating. Anyway, Zelena hops up to make tea leaving Snowing alone to discuss how awesome she is while she poisons Charming’s tea right behind them. Chraming: Isn’t it a little weird that we’d never seen her before we forgot a whole year of our lives and ended up back in this cursed land? 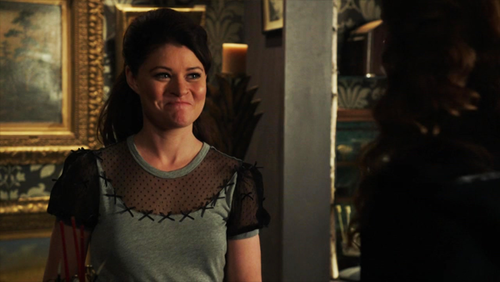 Snow: But maybe what I forgot is that she became my bestie in that year! Charming: Oh, well, okay, that makes sense. Zelena: This is way easier than I thought it would be. Then Zelena strangely stops Charming from drinking the poison tea like four times by asking random questions. 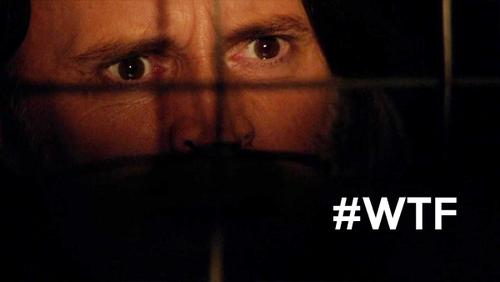 It is not anywhere near as strange as the Rumple scene… but it is still strange. Back in the enchanted forest Charming finds the magic plant, but as he is harvesting it he hears a cry for help. He finds a tower and climbs up to discover a princess. Rapunzel’s parents rule a neighboring kingdom and after the tragic death of her brother, she is next in line for the throne. She came to find the same magic plant of courage that Charming did but it didn’t work and a witch trapped her in the tower. This is more like the plot of a video game than Tangled. 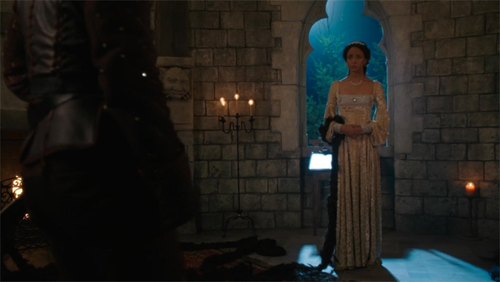 Charming tells her he is going to get her home but the witch appears. Back in Storybrooke, Zelena has cast such a spell over Snowing I won’t be surprised if she is living with them next week. Charming leaves Snow in her capable/evil hands and heads back to continue the witch hunt. Now we pause for an adorable moment in the park between Madam Mayor and Henry. Henry: I like this town. The city is exciting but it’s so crowded I get lonely. Regina: I know what you mean. In small towns like ours everybody knows everybody. Henry: Can I tell you a secret? Henry: I don’t think my mom is just here for a case. I think she ran away from her boyfriend because he asked her to marry him. Regina: Did you want them to get married? Henry: I want it to be more than just me and mom. I wish I had a family, you know? Regina: I think someday you will have more family than you know what to do with. Regina: Trust me on this. Adorable. Henry and Regina should be the new Operation Cobra. 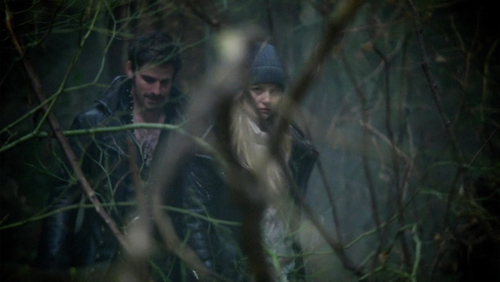 Tromping through the woods part 748,924: Hook and Emma. Hook: Here we are, tromping through the woods again. Emma: It was the jungle before. Hook: Speaking of monkeys, are you sad you’re not getting married? Emma: I wasn’t speaking of monkeys. Hook: Is your heart sad? Emma: Yes, fine. My heart is sad. Hook: A heart that hurts is a heart that works. Emma: I think I see a farmhouse. Also tromping is Charming —and Rapunzel’s witch! In Storybrooke! Who saw that coming! Besides everyone. Emma and Hook find the farmhouse empty and suspicious. Even more suspicious is the storm cellar in the back. Emma wants to bang on in but Hook would rather have some magical backup against the wicked witch. 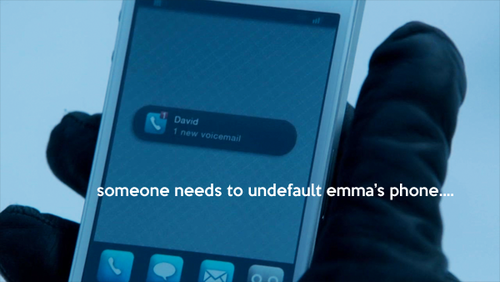 Emma pulls out her phone to call in Regina and discovers David has left her a voicemail. They rush on back to the forest to help him with the witch. Here is where the camera work is clever. Charming is battling the witch in both the present and the past. The ‘twist’ is that the “witch” is actually a boggart – it copies whoever ingested the magic plant and uses their fears against them. The only way to break the spell is to admit to the fear and stand up to it. Rapunzel claims her nobility and hacks off her hair so her wraith doppelganger falls to the ground; Charming admits he’s afraid to be a father and is able to hack his wraith doppelganger with his broken sword. Josh Dallas has a lot of fun playing Not-Confused-Or-Noble-Charming and Rapunzel also gets to show a little bit of her sassy side. We learn that Rapunzel’s brother died saving her which is why she is scared to rule. She doesn’t think she deserves it. Charming convinces her to go home. And then something amazing happens: Charming admits his fears to Snow. 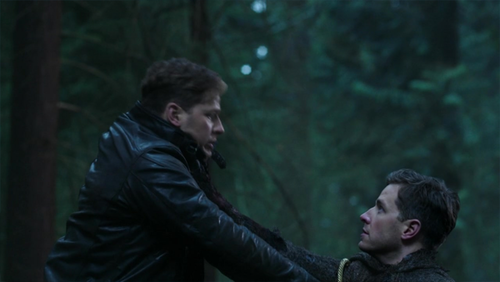 Charming: I’m scared I won’t be a good dad. Snow: You’re a great dad. Charming: Sure, now. But our baby will be a baby not a thirty year old woman damaged by her traumatic childhood in foster care because I sent her away in a magic box to save our kingdom. Snow: Well, when you put it that way. Charming: I want to be the hero you need. Snow: You are, silly, and we’ll do this the way we do everything. Together. Charming: Too bad we’re gonna have to do this all over again in “nine months”. In the present, Hook, Emma, and Regina show up just as Charming defeats his demons. Charming: It wasn’t the witch, it was an evil me. I killed him with my sword. Hook: That must have been very satisfying. Emma: Where’s your sword now? Charming: I don’t know, it disappeared. Regina: It didn’t disappear, it was stolen. The sword was a symbol of your courage. And it shows up in Zelena’s purse. So! Zelena has stolen Rumple’s brain and Charming’s courage. Whose heart will she go after? Henry is the most obvious choice of victim, his heart was already a prize earlier in the season. Hook has spent the last three episodes wearing his heart on his sleeve but it is more likely Missing Neal’s heart would be used of the Emma Triangle. That said the monkey she didn’t marry could have been after Emma’s heart in the first place. Or there is Snow who is enamored of Zelena and whose heart has been a plot point in the series and in her original fairy tale. So many options for the Tin Man! Let me know your guess. Our heroes get back to the cellar and find the lock busted and the cage inside empty. They find straw shaped gold and realize who is most likely to have been here: Rumplestiltskin. But where did Rumple go?